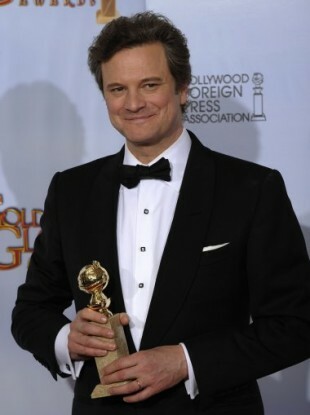 ACTOR COLIN FIRTH is a front-runner for an Oscar after winning a Golden Globe for his role in The King’s Speech. In the LA ceremony last night, Firth took Best Actor for his turn as British monarch George VI as the king who struggles with a speech impediment that humiliates him in public. The Golden Globes, voted for by the Hollywood Foreign Press Association, is seen as a positive indicator for how the Academy Awards may be doled out at the end of next month. Last year, Firth narrowly lost out on the Best Actor award in both ceremonies for his moving turn as a grief-stricken professor in A Single Man. However, there may be another obstacle in his way to Oscar glory this year, according to The Telegraph. The newspaper claims that an email is being circulated to member of the Academy of Motion Picture Arts and Sciences – whose votes decide the Oscar winners – which claims that George VI had been anti-Semitic. The email – based on a recent blog post on the website of New York magazine – claims that George VI wrote in early 1939 to British foreign secretary Lord Halifax of “steps” being taken to stop Jewish refugees from Nazi Germany from fleeing to British-controlled Palestine. The Telegraph quotes historian Andrew Roberts as saying that George VI was simply reflecting “government policy at the time” but that it didn’t mean he was personally anti-Semitic. The King’s Speech lost out in every other category it was nominated in last night apart from Firth’s. The big winners of the night were Glee and The Social Network – the full list of nominees and awards is here. Email “Golden Globe winner Colin Firth 'might lose Oscar' over claims George VI was anti-Semitic”. Feedback on “Golden Globe winner Colin Firth 'might lose Oscar' over claims George VI was anti-Semitic”.